Definition at line 30 of file mbstring.h. Definition at line 820 of file mbstring.h. Definition at line 1021 of file mbstring.h. Definition at line 34 of file mbstring.h. Definition at line 29 of file mbstring.h. Referenced by _mbcjmstojis(), and test_ismbclegal(). Referenced by _ismbcalpha(), and _mbctoupper(). Referenced by _ismbcalpha(), and _mbctolower(). Referenced by _mbsicmp(), and _mbsicoll(). Referenced by _mbscspn(), _mbsspn(), and _mbsspnp(). Referenced by _mbscspn(), _mbsncat(), _mbsspn(), _mbsspnp(), _mbsstr(), _mbstok(), _mbsupr(), and test_mbcp(). 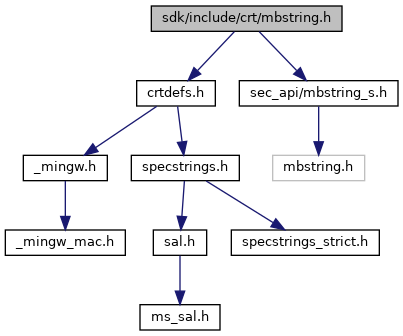 Referenced by _mbsdup(), _mbsnbcat(), _mbsstr(), and test_mbcp(). Referenced by _mbscspn(), _mbsncat(), _mbsrchr(), _mbsspn(), _mbsspnp(), _mbsupr(), and test_mbcp(). Definition at line 15 of file _mbsnlen.c.